It’s been a busy couple of years for Jason Pomeranc. 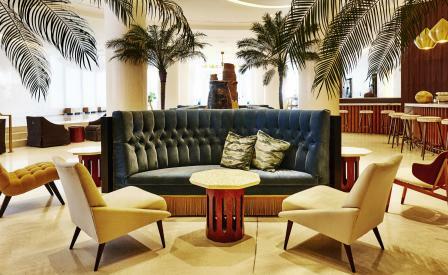 Since leaving Thompson Hotels and launching the Sixty brand in early 2014, the seasoned hotelier has been steadily reviving some of his most recognised properties, such as his iconic 60 Thompson hotel in New York City that is known as Sixty Soho today. While covering past ground is well and good, the group heralds a new era this month with the opening of its inaugural original property, Nautilus in Miami’s South Beach. Designed in the 1950s by architect Morris Lapidus, the hotel has been carefully restored by global office Arquitectonica, who has not only preserved its iconic neo-baroque features, but imparted a fresh contemporary elegance too, in particular with The Lobby Bar which, armed with a seductive (and landmarked) ‘Staircase to nowhere’, serves as a captivating throwback to another time. Outside, a saltwater swimming pool, flanked by cabanas, proudly faces the beach, with a lawn stocked with Bolivian hammocks also sharing its ocean view. Upstairs, each of the hotel’s 250 rooms are equipped with vintage-style bar chests and most come with ocean views. The most delightful room has to be the 8th storey penthouse, which boasts two bedrooms, a kitchen, dining room and a grand garden terrace.